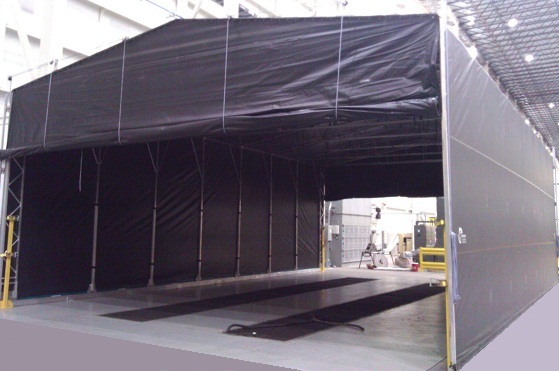 All-Weather Industrial Shell; our enclosures can be safely used and mounted both indoors and outdoors. Chameleon’s optional accessories can provide you with strict environmental control of temperature, particle, vapor and light conditions that you may need, including a worker access door and equipment interfaces for access to the workspace. Why would I want a retractable enclosure versus a typical metal booth with a flimsy front curtain? Chameleon retractable enclosures are excellent for Magnetic Particle Imaging (MPI) and Ultra Violet (UV) testing where strict control of lighting conditions is needed. 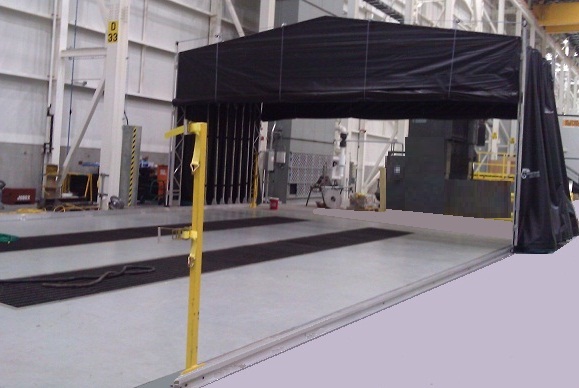 Being retractable allows you to regain the use of the floor space for other productive purposes, such as body work or vehicle maintenance. All-weather industrial shell means that these enclosures can be used and mounted outdoors. Seals air tight as the fire retardant shell tends to follow the contour of the floor and the shell’s seamless construction insures that light or dust will not seep through the walls (like economical metal booths). 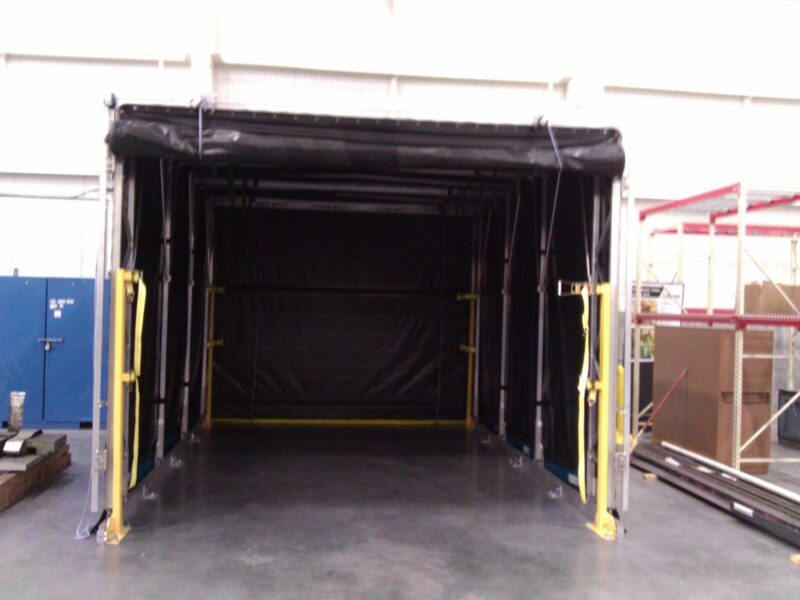 In manufacturing or industrial finishing, our retractable enclosures provide 360° access for overhead cranes and forklifts to the blasting/work area. 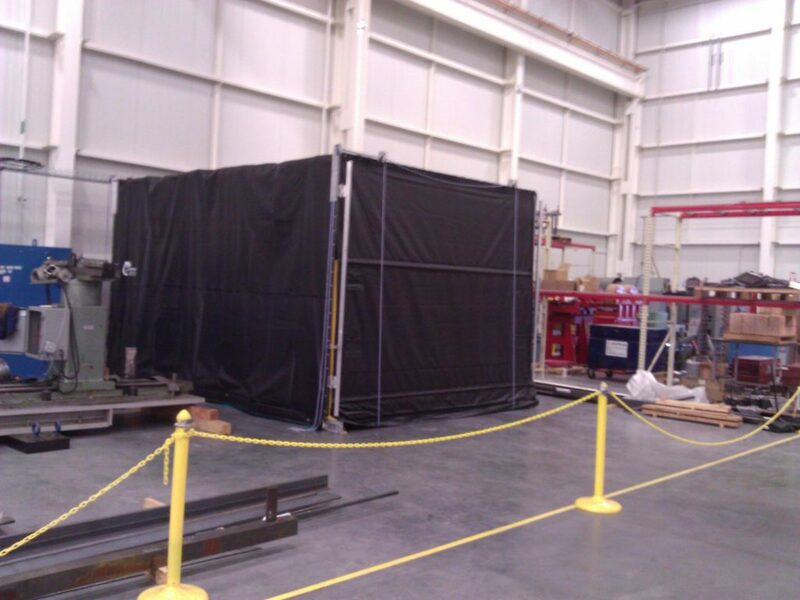 What are your retractable NDT enclosures made out of? All of our blast enclosures are constructed of aluminum or steel and tear-resistant 18-ounce reinforced Black Opaque PVC shell to keep unwanted light out. They are also fire-retardant meeting NFPA 701 and California Title 19-Section 1237. Chameleon retractable enclosures are shipped in kit form by truck. We will provide you with the most economical shipping price available. An indication of assembly time will be provided on your quotation. What does the NDT enclosure come with? The NDT enclosure comes with the first set of dust filters and all the necessary hardware and instructions for easy assembly. The structural components are aluminum & galvanized steel. They can also be manufactured in galvanized steel if needed. Do I need to have a forklift to unload the enclosure when it arrives? Ideally you should have a forklift. If you don’t have one, you can break open the crates in the truck and unload the pieces one at a time. You will need to make arrangements with the delivery driver if this is the case (extra charges may apply). You must let us know if you will not be able to arrange a forklift at the time of your order. Shop Floor Manager Medium-sized Manufacturer in USA.